Today I had an interesting issue. Well it started a couple of days ago where the Joey’s in the house were losing connection with their linked Dish Network Hopper devices. I kept rebooting the Dish Network Hopper in each room, but still the problem persisted. Then the other day I started having internet connection issues. What I noticed was my Internet Gateway Router was rebooting on it’s on, and was NOT giving out any new DHCP leases to machines on my network. So I Started to wonder if the two things could be related. What I found was that YES in fact they are! Below is a diagram of the installation I have where each Dish Network Hopper is hard-wired to the internet. The picture only shows one, but they both are as well. What I learned was that neither Dish Network Hopper was getting a DHCP address on the LAN and thus no Internet connectivity. I thought the loss of internet was preventing them to call home removing access. Instead what I learned was that the MoCA connection ACTUALLY allows each Joey to get its OWN DHCP address on the LAN via the hopper. I can prove this by looking at the network DHCP connections in the gateway router below. What we see here is that the LAN DHCP has given out IP addresses to the Dish Network Hopper itself, as well as the Hopper MoCA connection. In turn we see IP Addresses on the LAN to the Joey MoCA connections! Interesting to say the least! This tells me that although the Joey’s and Dish Network Hopper all use the new MoCA connections, there is some level of connectivity on that MoCA link using a standard IP Address. The really cool part is you can actually PING all these IP addresses including the Joey’s even though they are NOT directly connected to any ethernet connection. 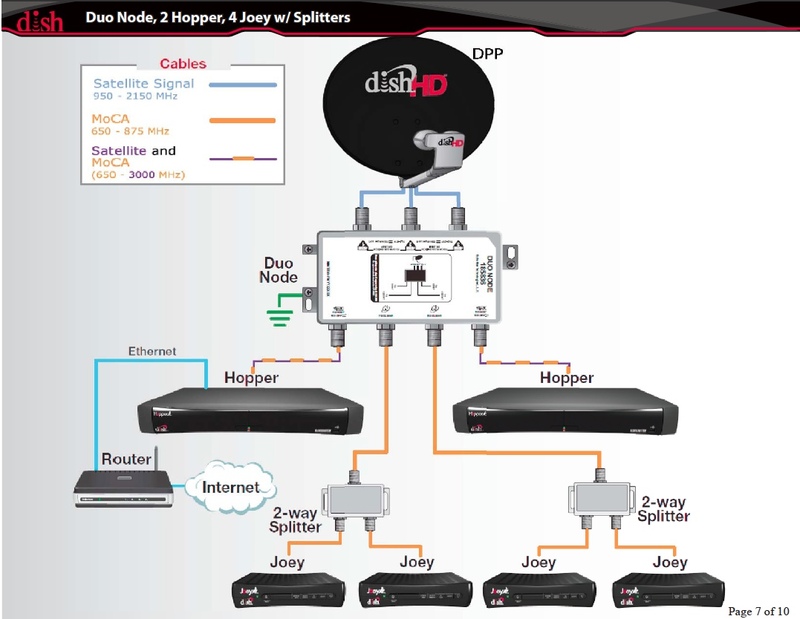 So if you are following what I am saying Joey’s get an IP over the Coax, via MoCA, through the Dish Network Hopper ethernet connections. We know this is true since the only cable connected to a Joey is the Coax. Cool right? Well sort of, unless you lose your DHCP/Internet Gateway device! Now what happened was when I lost my gateway device and NOTHING was getting DHCP addresses not only was my computer internet access wonky, but the whole home DVR stuff stopped working. Now I know it was not because there was no internet access, it was because there was no DHCP server on the network giving out addresses. I was surprised to see that MoCA and Dish Network Hopper whole home DVR connectivity does seem to have a dependency on LAN connections. What makes me more curious is what if you had no internet access and thus no DHCP server in your house? I think Dish Network states internet access is a requirement for the Dish Network Hopper to work. None of the diagrams show wiring WITHOUT a Router and internet access. I think this is true because any Internet gateway router will act as a DHCP server in the home. In turn it will ensure that the MoCA devices all get LAN IP addresses. My best guess is that you cannot have the Dish Network Hopper system without a router and thus a DHCP server. I do think internet needed for call home, on demand DISH Online access. However knowing now that the REAL requirement is the fact the devices are all getting LAN address to communicate to each other from that router was quite interesting. So if you ever have issues with your router affecting your internet access, and you have the Dish Network Hopper whole home DVR, you might see Joey and Hopper connection issues as well. Don’t get too jacked up over it, just know that like all technology there is always some dependencies in between you need to know about. I hope you found this useful and interesting, I know I did! I still maintain the Dish Network Hopper setup is the coolest technology for Whole Home DVR. You can now pull DVR recordings from Hopper to Hopper so I would not trade it in for the world. It’s just interesting when you learn how a cool new technology like MoCA works and still uses some traditional network connectivity inside it. second… where u got that digram from….it,s not a home digram unless u did the same set up. i know that for fact cuase am one of them. between the HOP. AND jOEYS. and if there is no ethernet at the time , u would be able to acsses content on the hopper(s) but not the Joey(s). cuase MOCA in it self is not a communication technology , as much as it is an enabeling communication techn. , what i mean is that MOCA will enable ethernet communication over the coaxials but will not replace the ethernet way of communication. as well as whole home Gaming solution. Pretty sure I found the PDF on one of the satellite forums when I asked the google. They had a whole PDF with multiple diagrams. This was the closest to my setup in the PDF. Good to hear they are working around the DHCP requirement that really bit me good and through me for a loop until I figured out there was a router/DHCP issue on the network. I just ran into this issue, the biggest problem was that my switches are not enabling the DHCP for some reason i had to connect the hopper directly to the router and the seems to be working fine for now, but im afraid i will continue to have IP conflicts. im thinking that if i put a new router with a different network ip addresses and connect it to the hopper and then the joeys via MoCA it will solve my issues but i dont know for sure or i can try resolving IPs to MAC addresses of my hopper and 3 joeys. “dish tech”. Sorry dude, you either need to go back to 3rd grade and repeat the basics of English, or quit posting such pathetic drivel. If you don’t comprehend the fundamentals of English, then how or why in the hell would anyone have the remotest belief that you could assist them in anything technical. The technician could not get the Hopper to connect to my network using exactly the same ethernet cable that had been connected to my ViP722, which was connected just fine. We were (as I had been before) plugging it into a router that I have set to work as a switch. Another cable then leads from it to my router running DHCP. This has worked fine for my PS3, ViP722, and other devices as needed. The Hopper would show Connected for just a couple seconds, and then drop. He swapped out with a cable he had brought — same result. Then he whipped out two network-over-A/C adapters and circumvented my “switch,” but still ultimately attached to my router running DHCP. That allowed it to connect and stay connected just fine. Doing my own tests after he was gone, I found that the Hopper (which was named) and an unnamed device (the Joey, based on your research) would temporarily show up in my router’s list of connected devices, and then drop. As soon as I switched it all back to the way he had it, the devices showed up and never dropped. Honestly it sounds like a finicky router/DHCP problem of some kind. the fact it give out the address then takes it away is is most likely an issue with the router not the hopper/joey. The fact it gives out the DHCP address when not using the switch portion of the router tells me that is the problem area. What the problem is…..heck knows, but it is a physical connectivity issue not a DHCP issue from the sounds of it. Thanks! I will reboot that device and see if that helps, and then go into the setup if that doesn’t help. So what is the fix? I have a DI-Link 524 Wireless Router and a Speed Stream 5100 AT&T Modem. I switched the modem to PPPoE and the router to the same. I assigned static DHCP IP Addresses (in my Wireless Router) on the Joey and Hopper in my house and gave them IP Addresses that the dynamic DHCP would never get up to unless I get 50 devices in my house. Still i cannot get the damn Hopper or Joey to connect. This is unbelievable that Dish Network has no clue that this is going on. I was on the phone with a clueless rep 2 days ago for an hour. Local DHCP is NOT the same as the WAN side PPPoE/DHCP. Dump the static addresses which should not be needed just let them get DHCP from the wireless router provider the router is in fact doing the routing for your network and not the Speedstream. Do other wireless devices get DHCP and reach the internet from the same wireless device? Also I DO NOT use Wireless for my hopper/Joey I use wired so that’s about all I can give for ideas. Chris- thank you for the reply. I currently have the DHCP wirelessly managing an IPad, an IPhone, a HTC Driod Incredible II, two laptops, and two Roku Boxes. It has been doing this flawlessly for years- even with my old Dishnetwork Duo8426 (whatever) Box. it was only after I plugged in the Hopper & Joey that the internet shut down and went crazy. I, without fully understanding PPPoE vs PPP and where they should reside (modem vs router), reset both my modem and router and did setup wizards based on settings for DSL. That is why I shifted the PPPoE to my router and allowed the router to do DHCP. I then figured that if it was a duplicate IP issue, by hard coding the IPs to the specific Hopper and Joey MAC’s, I could alleviate the issue. No dice though. I agree with you that it seems to be a LAN / WAN issue. Being a mechanical engineer and not software or IT guy, I dont know enough of what the WAN vs LAN settings should be. At this point, the only thing I could try if you have no more advice or suggestions would be to call Dish and get the wireless USB adapter and see if going wireless will help. I would appreciate any help. I will probably screw with it more in Sat morning though. Thanks Chris!!! I’m going to ask a stupid question here. How is the Hopper connected to the Router? I assumed you already had the wireless USB. I thought I read that was the only way to get reliable wireless on the Hopper. The Joey will only get an address THROUGH the hopper, so get the hopper connected to the internet and the rest will work most likely. Like I said mine is all hard wired and I only had the issue when my router doing local DHCP died on me. My hopper is on the LAN and thus connected via a CAT-5 cable from the wireless router to the hopper itself. If i factory reset everything, the hopper is fine for a few hours and then the disaster starts to shut down my internet exactly as you had stated previously. it could be a bad network interface on the hopper, but it sounds like it is losing its DHCP address. The usual setting for DHCP lease is at least a full day, but I would say it is less likely your router and internet, and possibly a back network port or interface on the hopper or the router itself. Change router ports, then try the other network interface on the hopper. If that fails see if DISH will swap out the hopper, but something is not staying online. If your other devices don’t drop internet connection then it’s isolated to the Hopper. Outside of that I don’t know if I have any other ideas :/. Knowing now that it uses DHCP protocol to get addresses to all the joey’s THROUGH the hopper means the Hopper itself is an important “Middle Man” in the communications. So if it is actually a bad unit, that could be the whole issue. I had the same issue where my Hopper would get an IP address but no connectivity. I called my Time Warner Road Runner internet access rep. He had me change the Channel on my router to 7 or 9. I tried 7 and it worked for about 30 seconds. I change it to 9 and change the bandwidth to 40 hertz. I do niot understand why because it is wired direct but it made a difference. I find the wireless to slow but my I pad works good will the slinger. Can not get the joey to connect to hopper via wireless. The hopper is set up to home network but the joey with only connect via MoCA. On install the joey was connected via wireless. How do I get it back? Hello, I am a dish technician as well. After reading quite a few of the posts I feel I should point out a few things I know. First, Any system that has a duo-node should be connected by a Hopper Internet Connector preferably. I avoid double direct connecting because of connectivity issues. Secondly, don’t get too consumed about the the networking details that go on when a Hopper is connected. I am yet to see a situation that I blame the router for the problem. In the system info screen the MOCA needs to be green, and the Hopper device needs to say good. The system is using quite a bit of the 3ghz coax cable (especially in duo systems) so if even one termination or line is faulty or not to specification the whole system can fault. And last, it has just become apparent in the last weeks that the many duo nodes are failing as the temperature drops outside. It needs to be relocated to the inside of the house. Other fixes include having a Sharp manufactured LNB installed and/or shortly I replacement outdoor duo-node is comming. I too am having DHCP and IP Conflicts. Hopper is to blame for all my issues. I have 3 macs for example on my network. Some connected Ethernet some Wifi,. Hopper is connected by Ethernet too. Along with xbox 360, OUYA, Google TV, and more. what happens is.. suddenly my mac computers will pop up saying “Another device on the network is using your computer’s IP address” and boots my MAC computer off. The mac address of the IP conflict lead to one of 3 mac addresses so far of the Hopper. I cant resolve the issue yet. I set as many of my Devices, Computers, Xbox 360, Ouya, Google TV, Imac, mac power book, imac G5, macmini, etc, Win machines all on STATIC IP addresses. Then i also set my Cable Gateway Router (Motorola SBG6580) to only hand out DHCP from like 192.168.1.3 – 192.168.1.30 and left the rest of the IP as NON DHCP. that seems to not fix. soon as i do, the IP conflict keeps saying “Another device on the network is using your computer’s IP address” no matter what i put in . then i need to unplug HOPPER Ethernet, or power cycle Router. then it always comes back. but i tried that and been having mixed results. in my routers config… if i simply RESERVE mac address to IP address and name it “iMac” i would assume the IP would never be taken by any other device. i will TRY again, for earlier it didnt seem to work. I am thinking of completely turning off DHCP, but i think some devices NEED it. What I actually do that is easier is in my DHCP device, which happens to be my router, I do DHCP ‘reservations’. I just get the MAC address of the Hoppers and other things I want to make ‘Static’ and setup the reservations on those 4-5 devices and let all other things remain DHCP. That way the offending devices are always given the same IP address via DHCP. It’s like a static IP, but done through DHCP based on the requesting device’s MAC address. Works like a charm! Thanks, ill try that too. I pretty much unpplugged the ETHERNET from my Hopper and tell it to connect to my GUEST WIFI. Everything seems GOOD. My Modem/Router is Wireless N, so its faster. I even tried accessing my DishNetwork Anywhere with my Nexus7 Tablet (Connected to Primary WIFI) and it worked great accessing my Hopper (Connected to Guest WIFI) I was surprised, thinking the 2 (Primary and Guest) would be seperate. seems to work. I hardly have anything on my Guest WIFI so hopper can grab and steal any IP’s on that side all it wants. I will post any further issues. I hope to eventually get my Hopper Hard wired into Ethernet some day too. Seems there is some ISSUE with hopper and taking over other IP addresses. For any one else reading this thread, you can go directly from your main host router to the the Joeys to the main host router via RJ45 LAN wired as a working alternative to using RG coax connections with Joeys. Since joeys have the LAN connection as well, they work great on this connection if you don’t want to use or don’t have support for RG6 coax with Joeys. As long and the Hopper is also connected to the main host router using RJ45 and RG6 to the SAT. Tried and tested on Hopper and Hopper 3 systems. Can use a GB external network switch as well in between the main host router, Hopper and Joeys for additional port usage. After reading the post I have found that I am also getting the same issue. DHCP issue must be corrected by the ISP. You cannot do anything for that. The post is very much helpful as I have learned a lot of thing from here. I’ve been having issues with my Google Wifi since I bought it back in June. IP conflicts, mesh network not working correctly, wifi going down all of the time. You name it it was happening. While the primary Google wifi point would “seemingly” not be affected the other two mesh points would consistently go down. I found this post and using David Voy’s suggestion of moving all my DISH equipment to a guest network fixed my problems and have not had a problem since. I have two hoppers and one wireless Joey and I believe that my TV’s are working better as well. Hoppers and Joey would need rebooted and reconnected often. Not sure all the in’s and out’s of how the DISH networking works but this solution worked for me. I want to thank David for his suggestion and hopefully this will help someone else.